In the previous installment, I talked about effective makeup jobs. There’s an effective one in this afternoon’s episode of Adam Adamant Lives! as well, kind of. You watch British television from the sixties, you figure you’re occasionally going to run into a few cases where they smeared some shoe polish on the white skin of the actors so they can pass as “foreign.” That’s just the unfortunate way of old television. I wish I could show you the sheikh from this episode, though. It’s that fine actor John Woodnutt, but even the man’s own mother wouldn’t have recognized him with the giant fake nose they stuck on him. After seeing Woodnutt’s name in the credits, I zipped back for a second look. Our son described the imitation hooter as “wet plastic,” so that led into a discussion of using things like “big noses” and “squinty eyes” as racial identifiers. I feel it’s important to point these out as we go. They’re good tools for learning. As for the rest of the episode, the only other point to cause any eye-rolling was the recurring use of the flashback to Adam getting suckered by Louise and The Face in the first installment whenever our hero gets thumped on the head. Our son is pretty sick of the flashback and got up to sit behind the sofa with an exasperated sigh when it happened again here. Otherwise, it’s an entertaining hour about criminals trying to get their hooks into the son of the ruler of NosuchArablandia. Dad’s in London for surgery and Junior’s got some gambling debts. John Hollis plays one of the criminals, and I thought that George Pastell was in it, but I was mistaken. Speaking of recurring themes, this is the second episode in a row where Miss Jones embarrasses Adam by donning a racy costume for her undercover work and enjoys the experience of making him uncomfortable. I figure it’s a fine little comeuppance for him assuming she was a prostitute in the first episode, but the joke’s got about one more airing before it gets tired. Let’s see whether they put it to bed or run it into the ground. So it’s time for the end of another season of Doctor Who, and another big season finale written by Robert Sloman and Barry Letts. “The Green Death” was directed by Michael E. Briant and I think it’s thunderously entertaining. I really like this story a lot. Watching the first part in isolation is a really fun experience. This is clearly a case – and a very rare case in the original run of Doctor Who – of a story built entirely around a companion’s departure. Jo Grant lets the Doctor know in the first episode that she does not want to gallivant off into space to have fun anymore when there’s a planet of her own to save. He knows, then, that their traveling days are over, but he thinks that she’ll still be with UNIT and they’ll work together when he comes back to Earth. And as befits a story built around the companion leaving, Katy Manning dominates this story. It’s all about her character and Katy is fantastic. It’s almost a shame that the very next Doctor Who companion would be so many people’s pick for the all-time best, because she overshadows Jo so much; at this point in the series, Jo is actually tied with Barbara as my favorite companion. Anyway, this story is set in Llanfairfach, a town in south Wales that is suffering from the closure of its coal mine, and where an outfit called Global Chemicals has set up. Global’s director is a fellow named Stevens, played by the awesome Jerome Willis. He’d later play the disagreeably cautious Peele in The Sandbaggers. And it really, seriously looks like Stevens is under the control of the Cybermen. Honestly, this story looks and feels like a sequel to 1968’s “The Invasion.” It isn’t, but watch the scene where Stevens’ mind starts to wander and he loses track of what he was saying. It’s not quite as obvious an “I’m being controlled” performance as, say, Michael Sheard in part one of “Remembrance of the Daleks,” but something’s up. And then he puts on this futuristic-looking headphone set…! But as much as I enjoy this story, it does have a couple of problems. One of these, which I may return to, is that the story’s heart is definitely in the right place, but its “pollution BAD alternative energy GOOD” tone is incredibly shrill and would be far less dated if it were a little less right-on. Another is a structural problem that leads me to employ the “unflattering cultural stereotypes” tag on this episode. 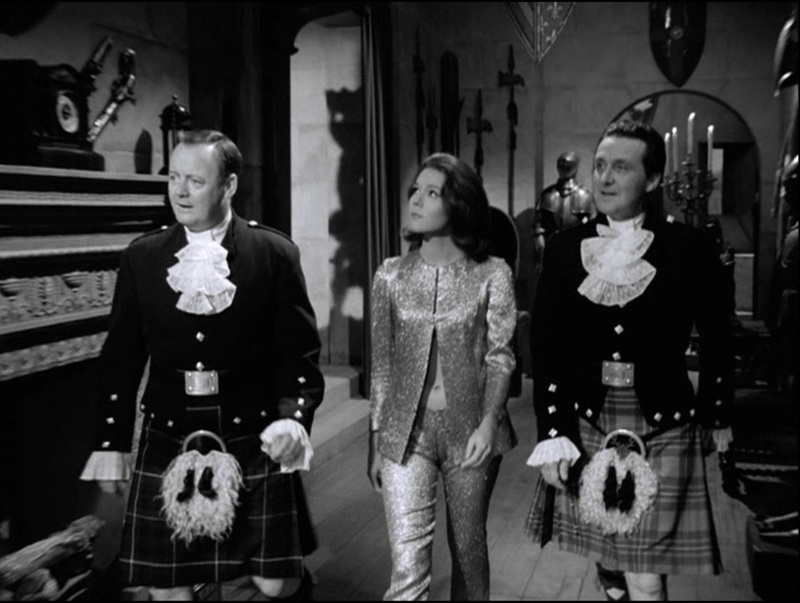 Since I’m almost totally unfamiliar with Welsh culture, I didn’t see anything as outlandish as, say, all the Scottish stereotyping in the Avengers episode “Castle De’ath,” but it isn’t really a case of employing cliche, it’s setting a story in Wales but telling a story about Englishmen. Tat Wood penned an essay in About Time entitled “Why Didn’t Plaid Cymru Lynch Barry Letts?,” and I don’t know that I would have noticed the problem until I read that. See, the Welsh characters in this story, even though they’re played by Welsh actors like Talfyrn Thomas, are not in control of their destiny. People from London are. Global Chemicals has moved to Llanfairfach to take advantage of the closed mine, and the hippie commune that opposes Global – about which more next time – is similarly made up of people who’ve dropped out and moved to the area because they share the young Professor Jones’s ideals and dreams. Between these forces, the Welsh people here have no agency. They’re all unemployed, apart from the milkman and a few part-timers who inspect the mine for safety and, as we’ll see, green slime. 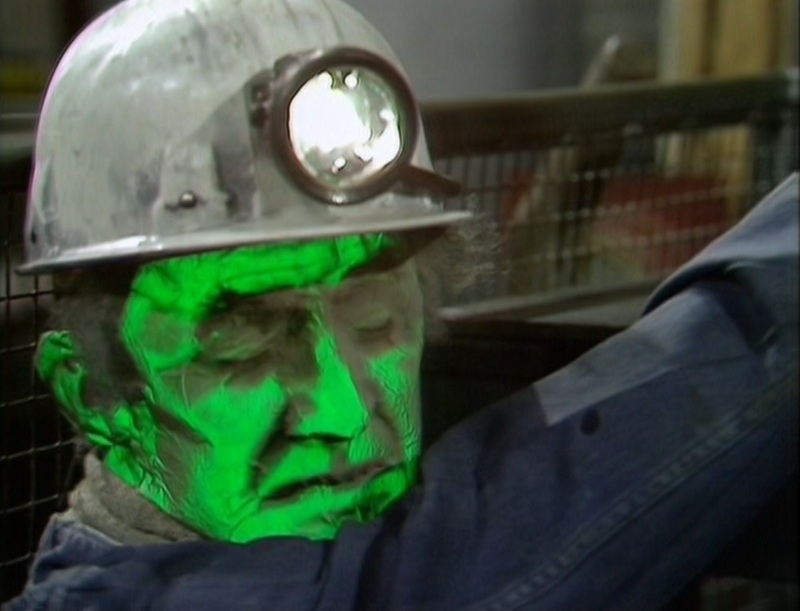 And this story isn’t about them, even though they’re the ones who feel the immediate impact of what’s going on, as people start coming out of the mine bright green and dead. It’s about Jo first, and about Global Chemicals versus the Wholeweal Community second. That, along with the script making sure that the milkman says “boyo,” is what makes this a little unflattering. I think that one theme that we’ll come back to in watching The Avengers is one I’ll go into in more detail later on, that the fantasy of the series isn’t merely the fantasy that comes from telling stories with robots and invisible men and a couple of monsters, it’s the fantasy of its setting. The Avengers is deliberately set in what Brian Clemens called a fantasyland, a tourist Britain that’s utterly removed from the real thing. So here we are in Scotland, ye ken, where we have bagpipes and phantoms and lairds and tartans and Robbie Burns and Bonnie Prince Charlie and castles and moats and villainous ancestors called “Black” and fishing in the loch. And popular Scottish actors like Gordon Jackson and Robert Urquhart as the feuding cousins of the De’ath clan. 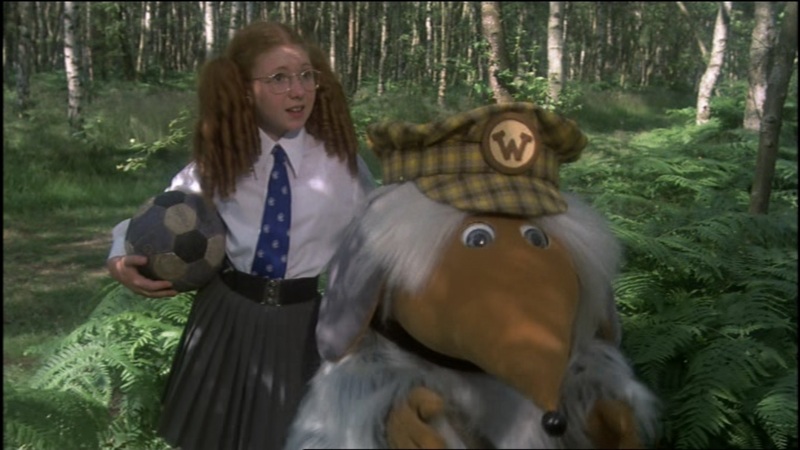 And we don’t have anything in Scotland other than these things. In fact, of the two things my son enjoyed most about this story, one was the knee-high argyle socks that the men wear with their traditional formal Highland garb. “Those are some big socks!” he exclaimed. The other, happily, was the rather magnificent sword fight that Patrick Macnee and Urquhart have on the big table in the dining hall, so he’s not just watching old TV to chuckle at the silly clothes people used to wear, like a “comedian” on one of those awful Things Sure Were Different Back Then! nostalgia programs. I don’t think it’s right to completely dismiss dramatic choices like this as merely lazy cultural stereotyping. It isn’t lazy; it’s carefully crafted in the same way that the director, James Hill, opened the story with a series of long, hand-held tracking shots through the elaborate castle set. The Avengers slowly reveals its unreality as the show progresses through the sixties, which is sometimes jarring because television viewers tend to watch every program as though it is set in “our world,” and The Avengers quite firmly isn’t. That’s not to say that it’s always a good or an admirable choice – some elements of this fantasyland Britain are crafted with the walls of exclusion – but the use of stereotype here isn’t halfhearted. In Avengerland, England can have some variety of people, places, and things, but all of Scotland is exactly like this. We had a little trouble watching One of Our Dinosaurs is Missing, a badly, badly dated 1975 Disney film. It does not seem to have ever been issued on Region 1 DVD, so I picked up a used Region 2 copy which turned out to be very badly damaged. I guess I should have checked it when it arrived a couple of months ago, huh? After a few minutes fighting with it, I rented it from Amazon and it’s not quite fair to say that all was well. Now, if you’ve never seen this silly film, all the ingredients are there for what should have been a fun and splendid little show. Helen Hayes and Peter Ustinov headlined a remarkably impressive cast of British comedy actors, at least a dozen of whom I recognized when I read the cast list. It’s a film I’ve always been aware of because, since I was a little kid in the 1970s obsessed with dinosaurs, I even had the View-Master reels for it, even though the dinosaur in question is just a long-dead skeleton. Plus it has the iconic, very odd imagery of a dinosaur skeleton being driven through peasoup-foggy London. So here’s how the plot goes: Derek Nimmo plays Lord Southmere, and he flees from China in the 1920s with a microfilm containing the top-secret “Lotus X.” With Chinese agents in hot pursuit as he arrives in London, he rushes into the Natural History Museum to escape, hides the film on a skeleton, and, chancing upon his old nanny, Hettie, while semi-conscious, he tells her how vital it is, before the Chinese villain, posing as a doctor, takes him away. Hayes, Joan Sims, and Natasha Pyne play the principal nannies, and Ustinov, Clive Revill, and Bernard Bresslaw play the main Chinese characters, and so it’s gangs of nannies and Chinamen in a romp through the fog-bound streets of London, and, the following morning, into a cute little village, with a stolen dinosaur on the back of a coal-powered haulage lorry. However, the film never gels and elements of it are quite awful. 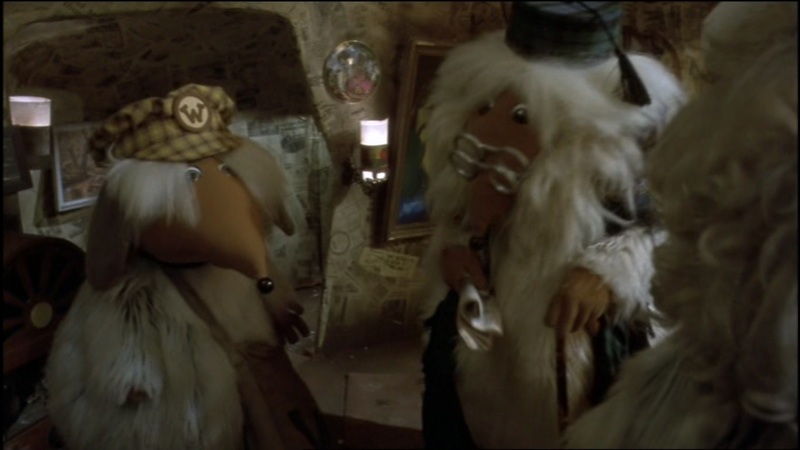 Of lesser concern: the fantastic cast is badly misused, just cameos, really. 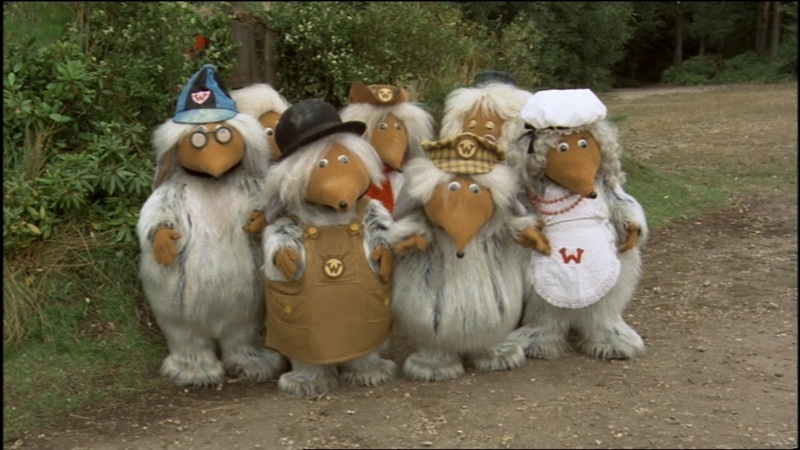 How anybody can, in all good conscience, assemble a group that includes Jon Pertwee, Roy Kinnear, Joan Hickson, Angus Lennie, Max Wall, Hugh Burden, and Joss Ackland and give none of them anything of substance to do (Pertwee would, later in life, call these sorts of glorified cameos “spit and cough parts”) is beyond me. Bresslaw, a great comic talent, is totally wasted, cast here only because the man was a giant and towered over everybody else. But the main problem is the yellowface acting from Ustinov, Revill, and Bresslaw, and it’s a big, big problem. 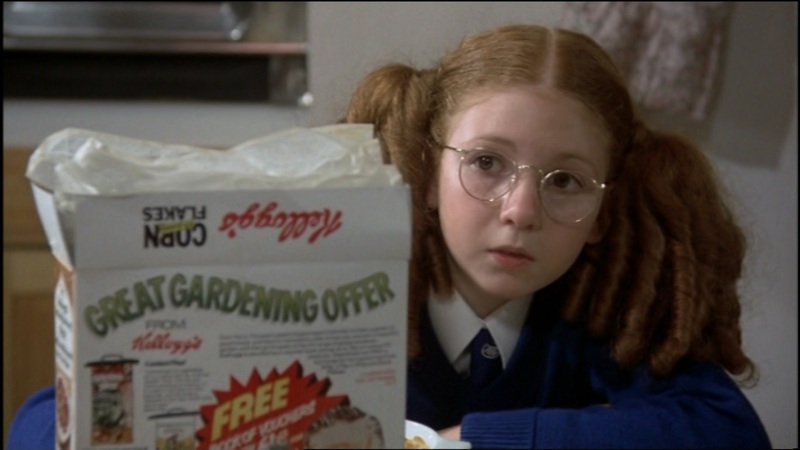 Even accepting that it was the seventies and quite a lot of this sort of thing happened in movies and TV then, mostly with Peter Sellers, it’s a lot easier to take this kind of material when it’s not played for laughs. 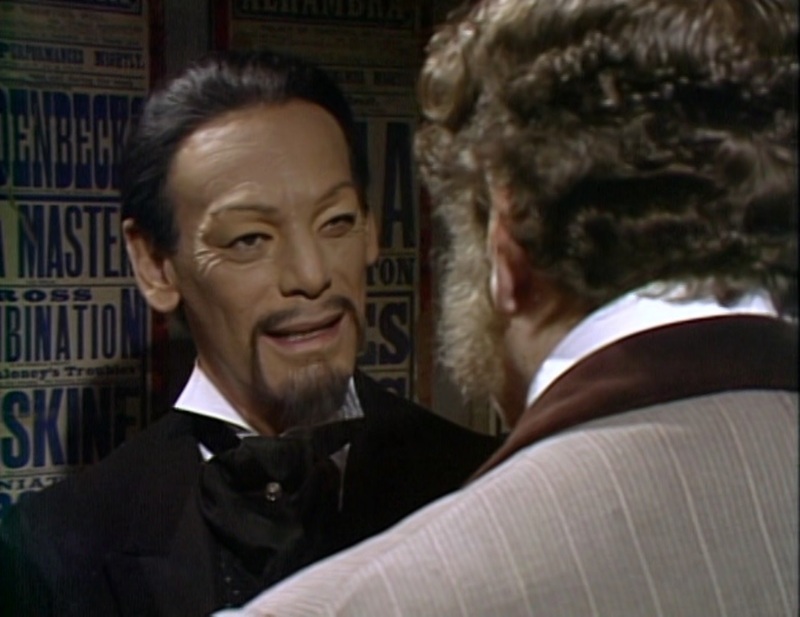 Doctor Who fans have, over the last few years, been drawing a polite veil of discretion across the casting of John Bennett as a Chinese villain in the very popular 1977 serial “The Talons of Weng-Chiang,” but I feel this is, while problematic, less of an issue when the role is played straight. It may have been insensitive to cast an actor of a different ethnicity, but it’s much more so when they’re cast to wear funny mustaches and say “Ah, so!” a lot. The film has a few good moments, among them just about anything that Hayes and Sims do together – although they really could have looked a little harder for Sims’ stunt driver – and a lovely little scene during the climax where Ustinov and Nimmo sit and discuss Revill’s terrible first day in his new job. There are a pair of quite amusing plot twists, but the action is, overall, far too brief, leaving Daniel more thoroughly bored than by any film that we’ve ever shown him. He giggled a couple of times, but I don’t blame him for being restless. This simply isn’t a good movie, and while it probably never would have been a classic, there’s not nearly enough slapstick to engage children, and far too much of it for anybody old enough to try and follow the plot and the humor for older audiences. Most of the cast’s best and biggest work was behind them at this point, although I suppose you might argue that Ustinov’s greatest success, as Hercule Poirot, was to come. But the biggest star-in-the-making was the dinosaur. Dumped in a prop warehouse at Pinewood Studios after this, it was retrieved by the Star Wars team and taken to Tunisia, where far, far more people saw it as a dead carcass on the planet Tattooine than ever saw it in this movie.